The 71st World Health Assembly (WHA) concluded on May 26 in Geneva, Switzerland. The decision-making body of the World Health Organization (WHO) was presided over by its Director General (DG), Tedros Adhanom Ghebreyesus. The five-day assembly discussed pressing health concerns and consensus resolutions surrounding a wealth of issues such as Ebola outbreak in DRC, pandemic influenza preparedness, non-communicable diseases, digital health, breastfeeding and snakebite, among others. A new strategic plan was agreed upon. It would span next five years, adopting its 13th General Plan of Work (GPW), designed in coherence with the UN’s Sustainable Development Goals, with specific focus on SDG3: ensuring healthy lives and promoting well-being for all at all ages by 2030. According to WHO’s official website, “It sets three targets: to ensure that by 2023, 1 billion more people benefit from universal health coverage; 1 billion more people are better protected from health emergencies; and 1 billion more people enjoy better health and wellbeing.” As per WHO, achieving this “triple billion” target could save 29 million lives. The Assembly also considered the progress report by the DG on the implementation of WHA70 (10) on Review of the Pandemic Influenza Preparedness Framework. The framework brings together all stakeholders in implementing a global approach towards pandemic influenza preparedness and response. While it approved of all the recommendations, the committee asked for the final analysis of the text to be submitted to the WHA in 2019, instead of 2020. The Assembly also adopted the Infant and Young Child Feeding (IYCF) resolution tabled by the Russian Federation and co-sponsored by 14 other nations, receiving the signatory support of many others. This came after much opposition from the US delegation, who issued a one-page ‘decision’, which marked an almost absolute absence of the International Code and the need for marketing restrictions. Much dramatic lobbying ensued, after which the resolution was eventually passed with notable changes. "Breastfeeding is a lifeline in emergencies for babies: it provides food, care, immune support and protects them from the worst of emergency conditions," the International Baby Food Action Network (IBFAN) said in its official statement, in support of the resolution. The first discussion centered on the recent Ebola outbreak in the Democratic Republic of the Congo. Members were made aware that the next few weeks would be crucial in determining whether the outbreak would spread from the affected forest area in the country to urban spaces. Dr Peter Salama, WHO Deputy Director-General for Emergency Preparedness and Response said the outbreak was on the “epidemiological knife edge”. The Assembly also discussed health conditions in the occupied Palestinian territory of east Jerusalem and the Syrian Golan. Discussion covered the need for institutionalised health resources in terms of medical and financial aid through capacity-building initiatives and investment strategies in Palestinian treatment and diagnostic capacities. 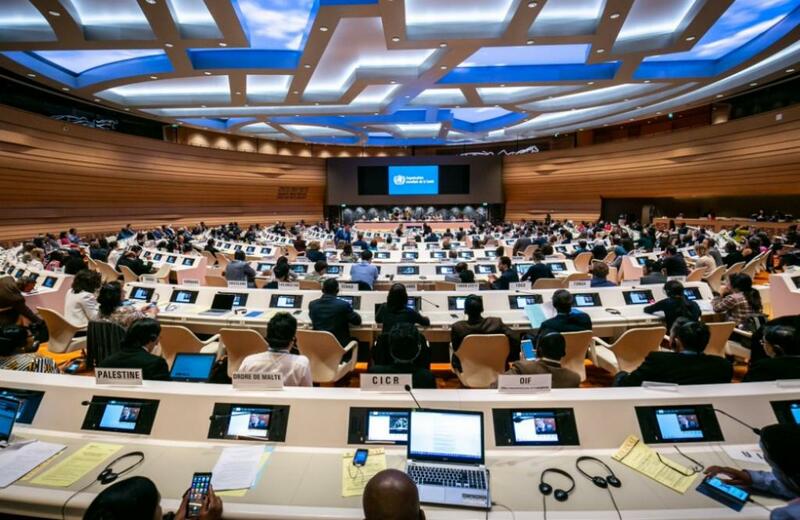 Member states at the conference advocated for increased global action on rapidly increasing contractions of non-communicable diseases, calling for an increased attendance of the heads of states to attend Third United Nations General Assembly High-level Meeting on the Prevention and Control of NCDs on September 2018. The international commitment to reduce premature deaths from non-communicable diseases (NCDs) to one-third by 2030 was reiterated, especially those caused by cardiovascular diseases, respiratory conditions, diabetes and cancer. The Assembly agreed upon other resolutions concerning topics like digital health, assistive technology and snakebite. The objectives of the resolution regarding digital health included urging member nations to increase development and usage of digital technologies as a means to advance public health. Delegates also agreed on a resolution to reduce the number of people who are mentally or physically disabled and/or killed due to snakebite. A report by Medecins Sans Frontieres (MSF), which listed 'snakebite envenoming' as one of the most deadly neglected tropical diseases (NTDs), was cited by the Assembly. The emphasis was on providing the primarily affected rural and agricultural communities, particularly in the Indian subcontinent, with affordable and immediate access to antivenoms. The event ended with a closing remark from the DG, who, very poignantly, said, "Ultimately, the people we serve are not the people with power; they're the people with no power."